Warren Isbister-Bear, diversity and inclusion consultant for Aboriginal engagement at the City of Saskatoon, speaks to graduates. A unique wellness program designed to encourage fitness in Aboriginal communities recently honoured its first round of students. 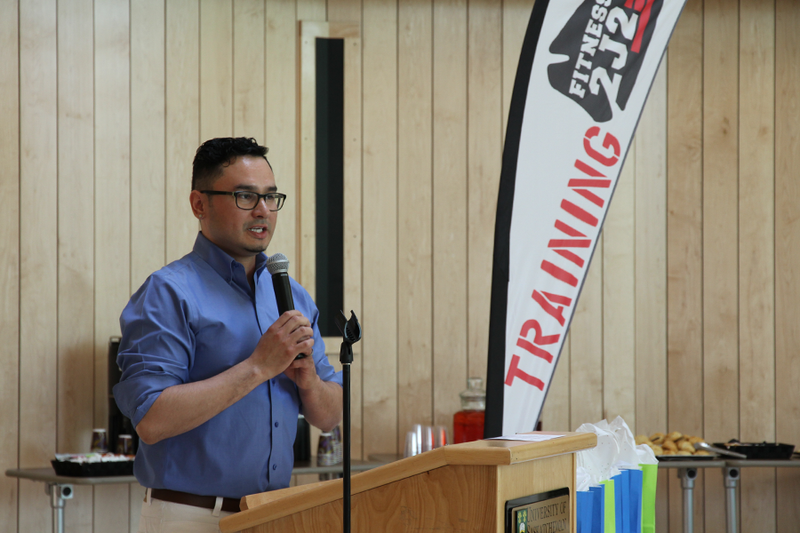 The Aboriginal Fitness Preparatory Program is partnership between the U of S, City of Saskatoon and Fitness 2J2, a community-based, socially responsible health and wellness company. The students were recognized for their achievements at a graduation ceremony on May 19 at the Gordon Oaks Red Bear Student Centre. With this new partnership and development of the preparatory course, these individuals are at a greater advantage point in successfully becoming fitness instructors. The six-week pilot program was designed to provide candidates with mentorship as they work toward becoming fitness leaders. The course focused on the theory portion of the program and included anatomy, physiology, nutrition, mentorship, and leadership. Students also attended fitness classes at the City of Saskatoon Leisure Centres to get exposure to the variety of class options and teaching methods. Fitness 2J2 facilitated the pre-theory portion of the program held at Gordon Oakes Red Bear Student Centre, which prepared students for the written exam. "It is critical that we collectively support our youth to be leaders in all facets of our society, said Candace Wasacase-Lafferty, director of Aboriginal initiatives U of S. "We must normalize Indigenous participation and be open to the gifts they have to offer."